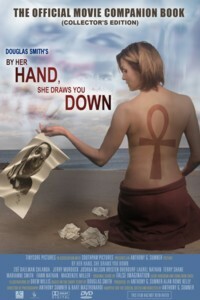 Here is the official companion book for the indie horror film “By Her Hand, She Draws You Down,” directed by Anthony G. Sumner, produced by Alan Rowe Kelly and Anthony G. Sumner, starring Zoë Daelman Chlanda and Jerry Murdock, and based on the acclaimed story of the same name by award-winning Canadian writer Douglas Smith. Described as “delightfully creepy” by Booklist, “By Her Hand, She Draws You Down” tells the story of a beautiful young artist with an insatiable and deadly hunger. The movie toured indie film festivals in 2010 to enthusiastic responses, winning multiple awards for Best Picture, Director, Actor, Actress, Score, Editing, and Photography. The movie will be included on the upcoming horror anthology DVD, Gallery of Fear. Note: this is the PRINT edition. Click here for the ebook edition.